The world's biggest IMAX screen has (temporarily) come down in preparation for the new screen installation. 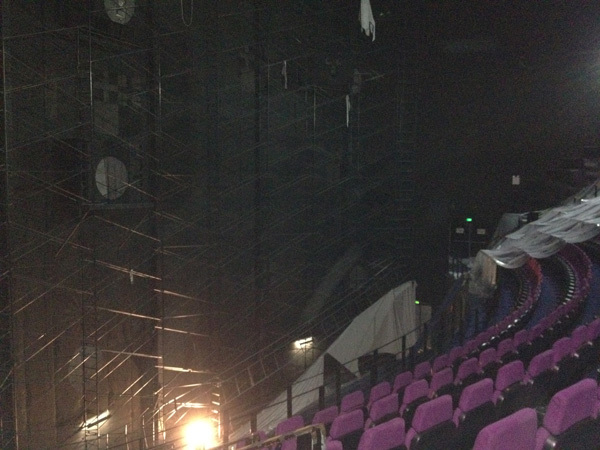 At about 8.30am this morning, a team of riggers climbed to the top of the auditorium and set the screen free from the scaffolding holding it up from behind. Dave from IMAX in Toronto, Canada was kind enough to retrieve us a section of the old silver painted vinyl that has been part of our film backdrop for the past fifteen years. On Thursday this week, we will watch in awe as the brand new vinyl is hoisted eight storeys high and stretched over the scaffolding before being prepared for painting. 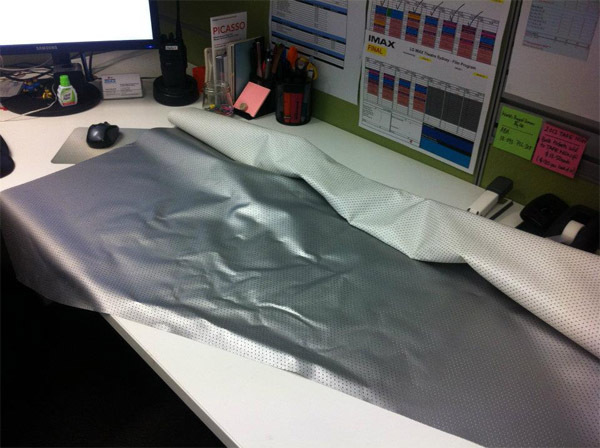 A special silver coating is required to enhance the screen's polarization for 3D films. We'll keep you posted on more news with pictures as events unfurl! 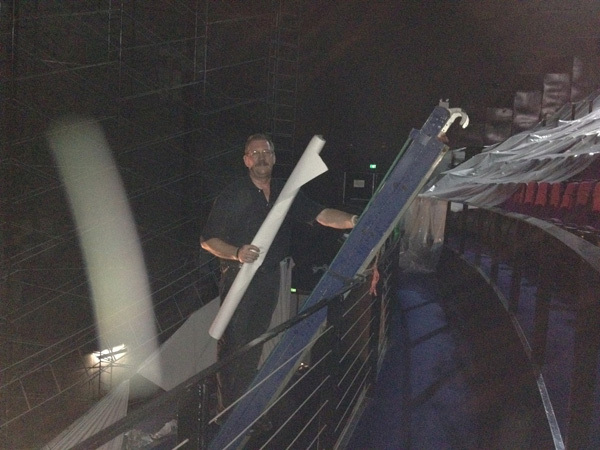 Here's Dave with a rolled up section of vinyl fresh from the theatre floor. Despite our recent rain, Dave still prefers Sydney's January weather to Toronto's minus 12! Close up, you can see the small perforations in the vinyl that allow the sound from the speakers located behind the screen to reach the audience in front. With the screen now removed, you can see the steel scaffolding frame located behind. 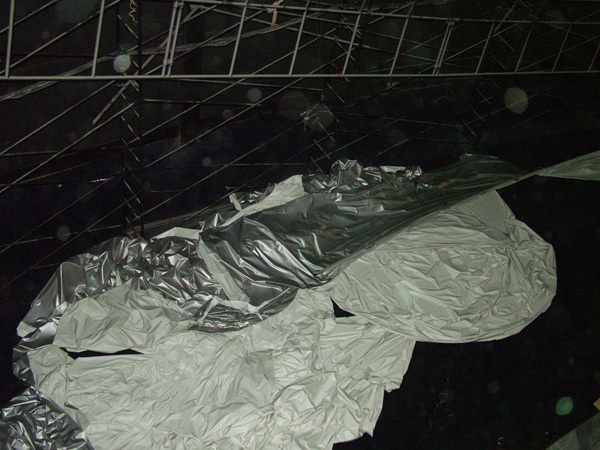 A crumpled mess headed for the floor. 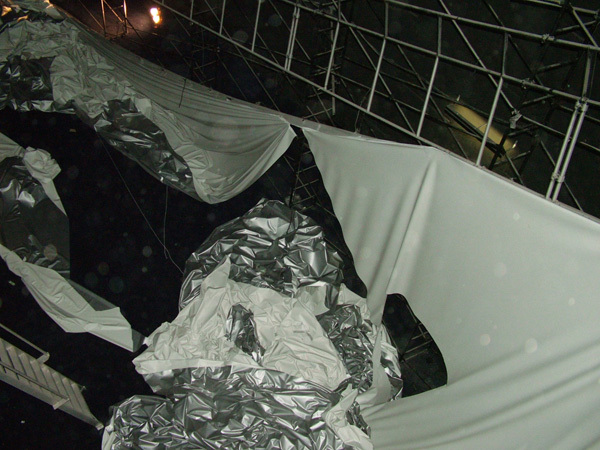 You can see the silver colour of the vinyl here as the screen lies in the "pit" at the base of the scaffolding.